The advent of the Star Wars Black 6″ Series got me thinking about how I prefer the 6″ scale for (human) action figures. It’s a strong preference, and yet, the more I thought about it, the more I wasn’t sure how my preference came about. It’s interesting, because there wasn’t really such thing as a standard 6″ scale for action figures until maybe the late 1990s. The first toy line that I can remember being at (or close to) six inches was McFarlane Toys’ Spawn; I suppose it shouldn’t surprise me that they were, yet again, a trendsetter in that regard. But it wasn’t until Toy Biz began using the scale for their Marvel superhero figures – and then Mattel followed suit with DC Super Heroes and later DC Universe Classics – that the idea of the 6″ action figure became commonplace. When I was growing up in the 1980s, toys were usually either 3¾” tall (Star Wars, G.I. Joe), 12″ tall (some Star Wars and G.I. Joe figures), or somewhere in between (Masters of the Universe, Ghostbusters, Teenage Mutant Ninja Turtles, Inhumanoids, Kenner’s Terminator/Alien/Predator toys, Super Powers, Secret Wars, Kenner’s Robocop). Transformers, of course, were all over the place, from mini-vehicles like Bumblebee to mid-size figures like Optimus Prime and oversize oddities like Shockwave. Meanwhile, McFarlane’s Spawn line started just around six inches (maybe a tad under) but by 2000, their figures, including the mega-popular Movie Maniacs, were close to a 7″ scale (which NECA later took up for their own movie and videogame lines). DC Direct stuck to an on-the-tall-side 6″ scale, while Mattel’s Movie Masters was an on-the-short-side short 6″ scale. Mattel says Masters of the Universe Classics is a 6″ scale but it’s obviously much closer to 7″. But enough history. Just what is so appealing about the 6″ scale? I’ll admit that I’m not entirely sure, but I’ve got a few ideas. More articulation – While 3¾” have made strides in this area over the last few years, in a zero-sum sense you can always put more articulation (at a cheaper cost) in a mass-market 6″ figure than you can in a 3¾” figure. This, I suspect, was part of the reason for Toy Biz slightly increasing their figure size from roughly 5″ to 6″ with Spider-Man Classics/Marvel Legends. It’s not that you can’t put more articulation in a 3¾” figure – Takara’s Microman figures from the early 2000s were incredibly poseable – but it’s a lot easier and cheaper to do it with a bigger figure. The simplicity – One inch equals one foot (for humanoid figures, anyway). As the photo at the top shows, very few toy lines adhere closely to this ratio – even within the same line – but it’s a big part of the appeal. It’s an easy ratio to remembering when determining how tall a figure should be, how large the accessories should be, and so forth. The sculpting – Six inches is about as small as you can get and still preserve really strong, detailed sculpting within any reasonable mass market retail price (You can do it at the 3¾” scale, but the production costs get prohibitive). To be fair, big strides have been made in 3¾” figure sculpting in the last few years, but take the same character and try to do the best job possible on sculpting it and the 6″ figure’s sculpt is going to be at least a bit better thanks to the larger canvas. “Crossover” possibilities – Once lines like DC Direct, Marvel Legends, DC Super Heroes/DCUC, Legendary Super Heroes, Lord of the Rings, and a number of smaller collector lines all coalesced around the 6″ scale in the early 2000s, it solidified the 6″ scale as a standard. Fans enjoyed being able to place their Batman next to their Spider-man, or Conan next to Gandalf. Of course, the 3¾” and 12″ scales also offer this, but it’s worth noting that while there are a number of good 6″ lines, as noted above, there is a dearth of good 3¾” DC figures and there’s no 3¾” Conan. The sense of “more” – Many of today’s adult collectors grew up on Masters of the Universe, Star Wars, G.I. Joe, and Transformers. With the exception of some Transformers, most of these toys stood around 5″ or less. The 6″ scale gives collectors a sense that there had been progress in toys – i.e., the toys were bigger – without being so large as to be overly expensive or difficult to display. The Four Horsemen have said they made the MOTUC figures the size they were because they wanted to preserve that sense of “chunkiness” for adults that a vintage He-Man figure felt like in their hands when they were children. Bonus question: Why not 12″? – “Well, if you can get so much articulation and detail into a 6″ figure, why don’t collect 12″ figures?” This whole editorial is entirely personal opinion, of course – I don’t think there’s anything inherently superior about the 6″ scale to any other scale – but here are my reasons why I don’t like 12″ figures. They just seem too big to me. I grew up loving to create scenes and displays with my figures, and in a very basic sense it was just harder to take in everything at the same time with large figures. And they take up too much display space. They’re generally too expensive, at least for a good 12″ figure. They don’t seem so much like an “action figure” as a “small person” to me. I absolutely hate fabric on action figures. It feels perishable, gets dirty and dusty easily and is a lot more difficult to clean than plastic, and the fabric itself never looks in-scale. I was hoping I’d have more to say about this when I started writing it, but ultimately this is pure personal preference. 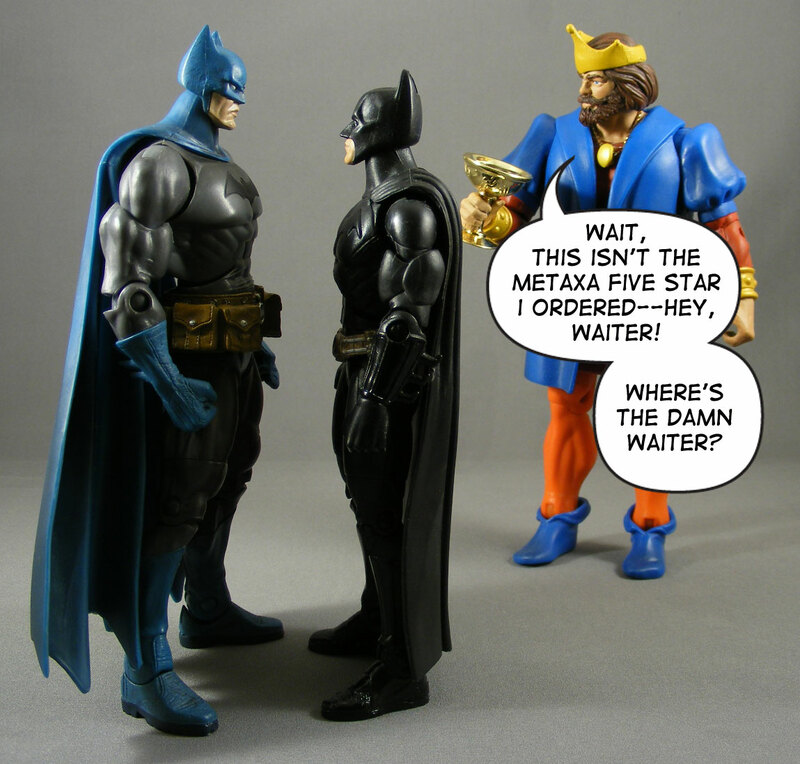 The 6″ scale does seem to be particularly popular among action figure collectors in the current era, but that may be solely due to the possibly arbitrary historical fact that a number of companies (particularly Toy Biz) produced some very popular lines in recent memory in that scale, and collectors just got used to it. Out of curiosity, I asked about the appeal of the 6″ scale on Twitter, and here are some of the responses I received. @poeghostal 3 & 3/4ths is too small, 5 hasn’t worked since the 90s, and 7 is too much. 6 inch hits the sweet spot. @poeghostal More detail in the sculpt and usually more articulation with 6″ scale. @poeghostal I’m warming up to it, in part because they stand out better on a shelf with a lot of stuff on it due to their being bigger. @poeghostallooks better on a shelf than a bunch of little Joes or whatever. Not that I don’t like Joes, though. I’m not necessarily tied to any one scale (i love neca, kre-o, g.i.joe, dcuc, etc) but I absolutely love the 5×5. 5 inches, 5 points is articulation. Kenner really did some great work in this area. Look at any of the alien vs predator figures and you will see some great sculpting (for the time)! And they look great on display! I would love to see a company do a really great new 5×5. I agree whole-heartedly about the 12″scale…too dirty, too big! Yeh, I hate to be one of those nostalgia hounddogs with my 'toys were better in my day' and 'kids these days don't get it with their video games and their hula hoops and their Pepsi Next and bath salts'… But looking back at what Kenner did in the 80s and 90s was truly remarkable. Currently I love things to be in 1/18th scale, mostly because I have so much Star Wars and that scale takes up a lot less room (theoretically) and is still a little cheaper. I don't get much 6" unless it really speaks to me. (Passed up on a lot of modern NECA stuff that looks great because I simply can't afford and/or make room for it.) I collected Ghostbusters but I think that's the only 6" I've bought in quite some time. Back in the early Aughts I loved the scale, but I think the end of the Lord of the Rings line and Toy Biz in general (along with aforementioned price/storage) kinda killed it for me. …Oh! I meant to talk about the old Kenner stuff! Yeh, I loved being able to have Aliens vs. Congo vs. Jurassic Park vs. Batman vs. Waterworld. While I keep a lot of my old toys back in my hometown at my parents' house until I have a properly sized place to put them, I did make sure to bring my Jurassic Park stuff with me recently what with the 3D rerelease and possible JP4 and all. To this day, it is still my favorite toyline ever. i too prefer the 6 inch scale, largely because it's big enough to load in sculptural detail and articulation, yet small enough to have many of them in a display. plus, within a 6 inch scale line, there's still economic room to feature characters of greater/lesser height and weight and it not break the bank. that's fantastic, because i do love scale variance within my display. it's versatile and still affordable. hard to beat that combo. When I think about the stuff available today versus what I collected as a kid, I see as wide a range of sizes and varieties of toys, but 6″ is the new 3.75″, The new industry standard. In the 80s Hasbro and Kenner locked up the 3.75″ market, and it seemed that very little could be found in that scale that wasn’t a Joe or Star Wars figure. Battle Beasts, MASK, Centurions, Sectaurs, Bravestarr, COPS, MOTU, Chuck Norris; hell, every other toy line sought to identify itself not just by design or action feature but by scale. Of course, those experiments in scale apparently never yeilded the consistent market that the aforementioned 3.75″ fellas consistently got and get. They did all right, but lacked the longevity. I think the FHM hit the nail on the head with their rationale for larger scale MOTUC, and market data has since backed it up. We loved the little figures as kids and apparently appreciate the same perspective as adult collectors with bigger hands. Certainly outlier scales do good business, but as much as the industry standard? 12″ is just too big, too ugly when inexpensive, too costly when done well (Hot Toys), or too much like a Barbie. That Tonner stuff just gives me the pedo-bear creeps. ^^^ I think that's not exactly accurate Misterbigbo, saying that 6-inch is the "new" standard, maybe in 2004, 2005 this was true, but not in 2013; Mattel in specific has been trying to get away from 6-inch since 2008, 2009 and the whole Infinite Heroes disaster. We're collectors so we really watch what is available for collectors; not so much all the kiddie mass-market lines, which would really be the "industry standard" — and I feel that market has been going marching headlong into 3.75" and smaller for the last 5+ years. Take a walk down the isle at Toys R Us or a chain box store and see what I mean… 6-inchers for adults, kids, 3.75… and Monster High moves more units than any of the stuff we adults talk about online, just as an example. Since 2008 and the huge success of the 3.75" The Dark Knight line (which collectors largely ignored and retailers made a huge profit off of) the push seems to be smaller and smaller, less oil & petrol per piece, but the same price. More profit per piece. Look who's new at retail in 2013: the new kiddie DC line, not DCUC beyond leftovers and fill ins. The only really big mass market reveals in 6-inch this year at Toy Fair were Star Wars, I can't think of any others off the top of my head beyond Marvel & DC- I'm not talking 18+ Neca movie things or subscriptions geared towards adults or online only; I'm thinking what I can walk into a brick & mortar store and buy. The vast majority of posable figures are 4 inches or smaller. Go to your local grocery store or big box , places that carry toys, most are 4-inches or even smaller. Even Dr. Who, which has been 5" for over 6-7 years, and was what many 5-inch fans were calling "the final 5-inch line" is going smaller this year with 3.75. I won't even talk about Lego and the whole minifig thing. I disagree on the cost factor too- you can get a huge amount of 90's ToyBiz Marvel toys for a fraction of what you'd pay for ML stuff. I think the 90's guys have a better variety of characters than Legends, and look better on the shelf (i'm looking at you Mr. Fantastic and Vision! ugh!) especially en mass, and I think the 90's stuff will hold up better over time – (Some of those middle waves of Legends have warpy knees and QC issues)- but I still love 6-inch figures as the detail is always nice and guys like Spider-Man and Batman really have been given "best figure of all time" toys in that scale. I have collected several scales equally over the almost twenty years I've been collecting: 5-inch, 8-inch Mego, 6-inch Legends, 12-inch scale. Now I'm pretty focused on just 3.75 as it's the scale of my youth, and it makes up the bulk of my collection at this point. Although I never turn down a good 6-inch figure! And it is a travesty that we only have three true Conan figures available: the 8-inch Mego Conan, the 5-inch ToyBiz Conan, and 6-inch Legendary Heroes Conan. I don't count the Arnie statues as figures, they're statues for those who can't afford the various Conan statues. And I still think that 6-inch one looks way too goofy. We really need a good 3.75-inch Conan. My fault in not specifying what I meant by "industry standard"; I meant for adult collectors the standard had become 6". I was ignoring the kiddie market primarily because I keep reading articles and posts on the protracted death of the action figure, and how we adults are allegedly the engine that maintains life support. Hell, most of my money goes to Lego, statues, and urban vinyl stuff these days, with action figures taking a distant fourth place, so I hardly keep up with industry news. Really good thoughts! I agree, especially concerning fabric, though I still love small mini figures. For my money the best sculpt and size for display may be 6″ but the best crossover line by fat is minimates. Spider-man can join the ghostbusters, superman can sport cap’s shield and Thor’s hammer a la JLA/Avengers… It’s a rich, rich field when you get down to two and a half. Is Superman too short next to Roboto? How tall is Roboto supposed to be? roboto, he-man, scare-glow, faker, teela… they've all got half a head on most of the DCUC folks. Sure, but how tall are they supposed to be? Without an “official” stat for them, who’s to say Eternians don’t dwarf humans and Kryptonians? who's to say indeed? meantime they look dumb standing next to each other. I agree. MOTUC look better next to Diamond Select or DC Direct figures than DCUC. Those MOTUC vs DCUC pakcs were such a terrible idea. I think MOTUC vs DCUC could have worked if Mattel would have packed in DCUC repaints that fans were asking for instead of re-releasing figures that were available in other two packs or as singles. The MOTUC fans ate those two packs up. The only two pack that DCUC fans wanted was the Aquaman pack with Mer-Man because he was HTF. Queen Marlena is from Earth in most continuities and she is the same scale as the other MOTU characters. The MOTUC are closer to 7" scale figures than 6" figures. While the 6" scale should allow for better sculpting I don't think most lines actually take advantage of that possibility. NECA does great work in the 7" scale but I don't think anyone really matches that at 6" unless you count DCC's work which is all over the place in scale. I am curious to see how figures turn out in the 6" Star Wars line because they're going to have to be pretty good to be better than the 3 3/4" line. I've liked the 6" scale for as long as I can remember. As a child, I was only interested in the 5" scale figures. While I had a few of them, I rarely played with the smaller figures like GI Joe or MASK. I guess the 6" scale is just an improvement on the 5" scale since they feel like they're the same size in my now adult hand, but usually come packed with great sculpts and articulation. I've often considered a 12" collection. And I've actually recently embarked on collecting a minor range of TV and movie characters in 12" scale because I want to display them together and 12" scale was the only common scale amongst the different properties. I don't see myself ever exclusively switching to 12" scale though. I think most of them do. There are some inconsistencies due to reuse, but mostly I think the problem comes with terminology. It’s technically 1:12th scale and although a 6′ character is 6″, not all characters need to be 6″ to be “in scale.” It depends on how tall they’re supposed to be. If He-Man and his fellow Eternians are supposed to be a disproportionally muscled 6’9″, then they’re in “6 inch scale.” DCUCs all hit around 6’3″ to be superheroically large, but they’re still in 1:12 scale. The only figures that I think are typically out of scale are the movie masters. I have no doubt Christian Bale is going to stand over 6′ in costume. Yeah, but she still shares the same body as all of the oversized amazon women, and they’re taller than they should be within their own line. MOTUC aren’t just hulking, but heavily disproportioned. Even claiming them to be around 6′ in a 7″ scale isn’t going to change that. They can fit in with 1:12th scale in the same way ML Hercules, Thor, or the Wrecking Crew does. If you have to work that hard to explain how a line of figures is in scale it's really not. I certainly don’t have any problems with 6″ scale, but it is not my preferred. I like 7″ better just because the sculpts and paint are a bit better, and I think the figures just have a better weight and chunkiness to them at that point. I also really like 3.75″ because they’re articulation and sculpt can still be very good, and they take up less space to store. A lot of the 6″ lines I’ve seen for some reason end up having odd proportions, specifically the toybiz and hasbro 6″ figures. 3.75″ also seems to have more realistic proportions for some reason, while there are plenty of Marvel Legends and X-men figures with oddly skinny waists, legs that are too long, things like that. Speaking of ML figures, I don’t think they’re sculpts are any better than G.I. Joe right now, actually I think Hasbro crammed more detail in the last few years of Joe, and Iron Man 2 figures than their larger figures. I'm happy to collect things in a lot of different scales, but if there is one thing that prevents the 6" scale from being my favorite, it the lack of vehicles and playsets for that size. Give me a 6" scale Batcave, or something similar, and I might come around. Interesting hearing the different opinions. I think honestly it depends on the companies within the market. 6" scale use to be great, with Toybiz cranking out articulated, affordable product and then DCUC stepping in, continuing the trend. But Hasbro Marvel Legends is lazy, Mattel DC is on life support and 6" prices keep climbing without bringing added value. On the other hand, NECA is a powerhouse with unbeatable value, Marvel Select is not too far behind and even the curmudgeon grandpa DC Direct/Collectibles is now dabbling in modern complete articulation, giving us the first fully articulated Batman. 7" scale is shining and its stock is only getting better. But who knows? In a few years, 6" companies might have their act together and 7"ers might fall off in quality (unlikely). It's all about the companies. I actually have more preference for 5 inch figures since I began toy collecting in the mid 90's. But since DCSH came out, I began converting to the 6 inch ones. And since I'm a huge comic book collector for both Marvel and DC, and with the 6 inch ones producing more and more characters for both companies, I began a full pledged 6 inch collector. Nowadays I very much prefer the 6 inch ones but is saddened to know that more and more toy companies are going the 4 inch route. And since their direction is to create toy lines for kids in 4 inch scale but with limited articulation, this might mean that a separate 4 inch action figures for collectors is being planned. If indeed that is the case, I hope they don't forget the 6 inch collector lines on retail. 6 inch Subs and exclusives are just so hard to acquire, And too pricey too. bravo. nice article. im on the 6" scale bandwagon. a great portion of my collecting universe is 6" scale. so when some comes out at 12"- i pass. i like my toys to be able to play or pose together.